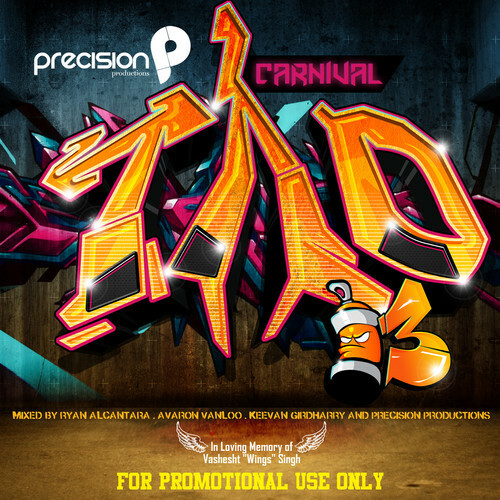 Carnival TAO 2013 is likely to cause overwhelming Mas and Fete memories and induce a tabanca of epic proportions. Presented and created by the entire Precision Productions family this unique mix will soothe every Soca loving soul, even as it takes a euphoric forage into such entrancing genres as Techno, Dancehall, R&B, and Hip Hop embracing a new world sound guaranteed to harmonically blow minds. Dedicated to the memory of their beloved friend Vashesht “Wings” Singh, who has left too soon and will never be forgotten. This medley of gyration tunes was only made possible through a fellowship of music that will forever be stronger than any other force in TnT. Proceed to download ONLY if you are prepared to push back and wine any and everywhere.